O how I love O Olive Oil's artisan vinegars and organic citrus-crushed olive oils! O boy am I excited that they have generously decided to sponsor this amazing giveaway! Maybe you'll decide to pick the gift set at the top..
Or any one of the other gift sets available HERE. O decisions, decisions! You already know that I love O Olive Oil's products, and now I hope that you will get to try them and love them as much as I do. what you would make with it (like "drizzle O Cassis Vinegar over sauteed broccoli", or if you're like me "drink O Pomegranate Champagne Vinegar straight from the bottle"). 2) Include your email address so I can contact you if you win and so O Olive Oil can send you a special offer via email every now and then (you can always opt out later if you choose). 3) Must have a continental US shipping address in order to receive the prize. Every 25th comment that satisfies all 3 of the above requirements will win the Natural Box gift set of their choosing. Up to 10 different winners. This giveaway is open until 5:00pm Pacific time Thursday, December 16th, 2010, or until all 10 winners have been determined. Be sure to tell your friends and family to participate - the more comments, the more chances to win! Sign up on the left under "Follow My Blog"
AND THANK YOU TO EVERYONE WHO PARTICIPATED! We would probably make a chicken or fish dish with the Lime OO and a yummy dressing for a salad with the pom vinegar! O! How I would DIE for one of these sets! I would love lime and pom for fresh salads or to use as marinade for chicken... the sky is the limit! I o-ppreciate the giveaway! also, thanks again for participating in Merry mondays... Your dishes looked AMAZING! These look great, I bet the Clementine Olive Oil & White Balsamic Vinegar would be great with some scallops & calamari on sliced fennel with a few orange slices. They all look good but I would go with the Clementine Olive Oil & White Balsamic Vinegar. I would use the Olive Oil as a steak rub before cooking it. I would use the Vinegar in a strawberry salad. p.s Please stop by our Blog we are giving away Saags Chicken Sausages to Four of our readers. O Blood Orange Olive Oil and O Porto Vinegar - It would be perfect for right now...roast some butternut squash and drizzle a little bit of both on top. oh yum!! O Clementine Olive Oil and O White Balsamic Vinegar. Would love this over a spinach salad. My pick would be them all...they are beautiful even just in the bottles! :D But seeing as I like to experiment I would get the Clementine Olive Oil & White Balsamic Vinegar. Experiment with the Clementine Olive Oil and with the balsamic...I would put it on everything! Love love love balsamic vinegar! I'd love to have the Clementine Olive Oil and serve with chicken and rice. I love a good piece of chicken seasoned with just the right spices and a bit of citrus or a delicious salad. This is such a fun giveaway! Thanks for sponsoring such a great giveaway! So hard to pick one, but I'd go with O cassis and O blood. I LOVE blood orange;, and he cassis must be heavenly! I'd use it to create a really fab salad w/blackberries, feta, and some candied pecans. Giving the contest another shot!!! OOohhh!!! These do look amazing!! I'm eager to peruse their site a bit more with these amazing flavors. Oooh, fun give away...I'd like them all. But first on my list would be the cassis vinegar/blood orange olive oil. I'd spike my carrots with the olive oil...yummy. Can you tell I really want to win this one? LOL, I've popped my head back in here about 3 times to see if any more comments have been posted. Again, I want the lime and ginger combo...I can imagine marinating shrimp or fish to grill. Yum! I would pick the blood and port. This would be great drizzled over some chicken and roasted. Also as a salad dressing. Reminder-I was a fan of the blood and port. Great as a drizzle on chicken...maybe even reduce the sauce. Fantastic!!! I would choose Champagne and Meyer. I would choose the O Lime and O Ginger set, and use that rice vinegar to make my own onagiri, my favorite Japanese food. 1) sherry and lime - i would both in salads and tacos. Am particularly excited in making various south esast Asian and Chinese dishes. I would make a great steak dinner and beautiful salad to accompany it. Clem and Zin for sure. I would drizzle it over a roasted beet salad with walnuts. Yum! I would love the Tahitian Lime Olive Oil and the Pomegranate Vinegar box and I would drizzle it over a lovely shrimp dish. Well, I don't know how many of the above comments will qualify with all three requirements, so I am still trying. 1. I would want the white balsamic/clementine oil and I would make some chicken with it and a salad dressing, too. O isn't she lovely, isn't she wonderful...? I'm talking about the Lime and Ginger set! It would be so great to win this combo. I love creating in the kitchen and I'd love to try this combo with my delish pork dumplings and asian style chicken. Yum!!! 2) I was amused to see salmon on the list because in my family we do wild salmon with creme de cassis and this would be amazing... some of the cassis vinegar on top of the salmon and the blood orange oil on a crisp salad accompaniament and mmmh. I'd like the O Meyer Lemon Olive Oil and O Pinot Noir Vinegar. I'd make a Chicken dish with both of them. O Tahitian Lime Olive Oil and O Pomegranate Vinegar sound great. I'd do some sort of shrimp dish with the lime olive oil, and use the pomegranate vinegar over some fresh fruit (probably reduce it first). 1)I'd love the sherry and lime... or the champagne and meyer. 2)I'd love to just dip some good bread and enjoy the flavors. Or maybe make a quick vinaigrette over salad. 1)I'd love the champagne and meyer... or maybe the sherry and lime. 2)I'd bake up some good bread, and just dunk to my hearts content. Crossing my fingers, thanks for running this giveaway! I'd like the O champagne and O meyer; I would probably use it over a chicken salad or a cedar-plank salmon. I would have to pick the O Champagne Vinegar and O Meyer Lemon Olive Oil set ... I heart champagne vinegar and Meyer lemons! And I would mix the two together for a light, refreshing dressing for a spinach salad ... getting hungry thinking about them! I would love to have the O cassis vinegar and O blood orange olive oil. 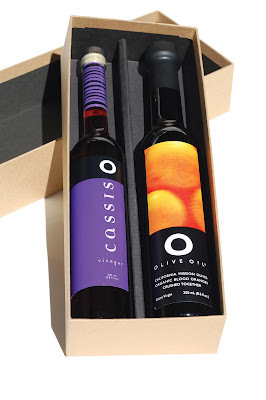 the cassis would be good with a salad with nuts, and the blood orange olive oil would be delicious to use with chicken! lime olive oil and pomegranate vinegar with salmon and a light mixed greens salad. O Pomegranate Champagne Vinegar. After first trying the Pomegrante Champagne Vinegar over ice, I'd use it in a 4 bean salad. BDH1122 at msn dot com. Thanks for the chance. Veronica-Such a wonderful giveaway! I am not choosy, I love them all! BTW-I tagged you...please check it out on my blog, and you know what to do! I'm not sure how many times we can try, so here's another shot. I would love the blood and port. It would be great as a dressing for a spinach salad with pomegranate and candied nuts. 1) Definitely the O Clementine oil with white balsamic vinegar! I'd make a fabulous vinaigrette combining the two and then toss roasted fennel with it! Yum! O Champagne Vinegar and O Meyer Lemon Olive Oil! I would love the O Clementine Olive Oil and White Balsamic Vinegar set! I've never used white balsamic vinegar before but I love, love, love experimenting with new flavors. I think I would try some sort of white Balsamic glaze to put on cheese stuffed turkey burgers, yum! The clementine Olive Oil and White Balsamic vinegar look yummy! I'd love to make a dressing for a salad with baby spinach! 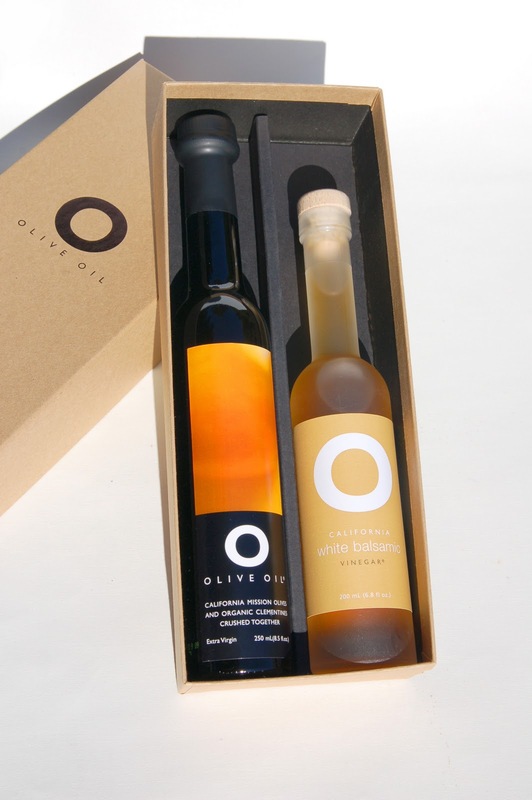 I would love to try the O Clementine Olive Oil and White Balsamic Vinegar. I'd combine the two and put it over roasted winter vegetables or roasted tomatoes... delicious! with potatoes, vegetables, or salad! Lime and pomegranate...on anything but how about tuna?! how about fruit salad?! Delicious and different...great stuff. O I'd love these! How about the cassis and blood orange, I'd probably use them in the bath first! He He I could imagine a beautiful raw root veggie salad with fennel, and a vinagrette made with these lovely products. I'm already a follower my email is ginawhatsfordinner@mail.com. Have a great day, I retweeted this for you. I would be aaaaaaaall over O lime and O pomegranate. I would probably use them first on a spinach side salad with fajitas. I would probably have them on the fajitas as well. Over Alder Planked Halibut. O my! I'm making dinner for 300 next Friday night and the Clementine Olive Oil with White Balsamic Vinegar would go great on my salad of Baby Greens with Clementine Segments, Shaved Fennel, Slivered Almonds and Pomegranate Seeds. I think i would have to try the O Cassis Vinegar and the Blood Orange Olive Oil. Sounds delicious for salads or roasted vegetables! Cassis and Blood orange sound amazing. I would use the cassis, a little honey, and garlic as a marinade for some chicken. I would roast the chicken and boil the remaining marinade (for a lengthy amount of time) til it reduces to a glaze. Oh man, what an amazing giveaway! I would go with the classic champagne and meyer lemon. The thought of using that to make a simple salad with fresh parmesan, peppery arugula and some tart green olives...heaven! O Pomegranate Champagne Vinegar. I am thinking this would be amazing on baked halibut maybe with some toasted pine nuts over a bed of wild rice. salad (with pomegranate seeds, of course) but there are so many other possibilities I'd love to try. The Lime and Ginger (for savory dishes) and Clementine and White Balsamic look heavenly as well. Wow, it's so hard to choose! I have a US shipping address. I would choose the O clementine and O white balsamic vinegar. I would use it first over our salads in place of our normal oil and vinegar. We love a really good olive oil - it does make a difference! Then I have a green bean dish I use oil and vinegar that I would drizzle this over. Live in Good Old NC! I would love the O champagne and O meyer. I'd bake some delicious salmon with the O meyer along with some dill, salt and pepper. Yum! I would make Martha Stewert's Brussels sprouts w/vinegar glazed red onions. pretty please let me be 100! ohh also.. just a reminder that Merry Monday's theme is Mint! Hope you can join! O Tahitian Lime Olive Oil and O Pomegranate Vinegar would be my choice and I'd use it to make a delicious pasta salad. I would choose the O Meyer Lemon Olive Oil and O Pinot Noir Vinegar. Yum, I imagine it would be delicious drizzled over warm pasta or bread, that would be my first attempt at making something with it. I am with wendy... just trying to be one step closer to 100! I'm your newest follower. I love all the oils... how can I pick just one? So close! I would love the lime & ginger combo. Awesome for sauteeing with shrimp! Hmmm...Now am I #100?!?!? If so, I want cassis +blood orange. The O Organic Clementine Olive Oil + O White Balsamic Vinegar looks delicious! I would use the oil to roast winter vegetables. Would give it a nice citrus flavor! I would definitely choose the O Tahitian Lime Olive Oil and O Pomegranate Vinegar. I would do some gorgeous endive leaves with a chunk of herb Gorgonzola cheese, a spring of parsley and a drizzle of both the O Tahitian Lime Olive Oil and O Pomegranate Vinegar. Oh wow! will today be my lucky day!!? I would love to have the organic clementine olive oil and white balsamic vinegar. What would I do with them? Well, I would use the olive oil to fry up some fresh fennel bulbs for a warm fennel blood orange salad, and I would use the white balsamic vinegar to make a dipping sauce for a nice crusty loaf of French bread. Mmmmmm . . .
Love them all. Let's get more numbers going. Let your friends know. Post link on your blog or facebook page. The more the greater the chances. I've already posted the link on mine. It closes in a couple of days if I'm reading it right. one step closer to 125! oh please oh please oh please! lime & ginger set looks delicious! i'd sautee some shrimp and make a salad! O Meyer and O Pinot. Drizzling it over salads would only be the beginning. I grew up in an Italian household where oil and vinegar were staples. This would bring a fresh face to all my old favorites! today is the end of the giveaway.... I am giving it my all! still praying for the goodies! i am sorry you are getting all of these notifications! 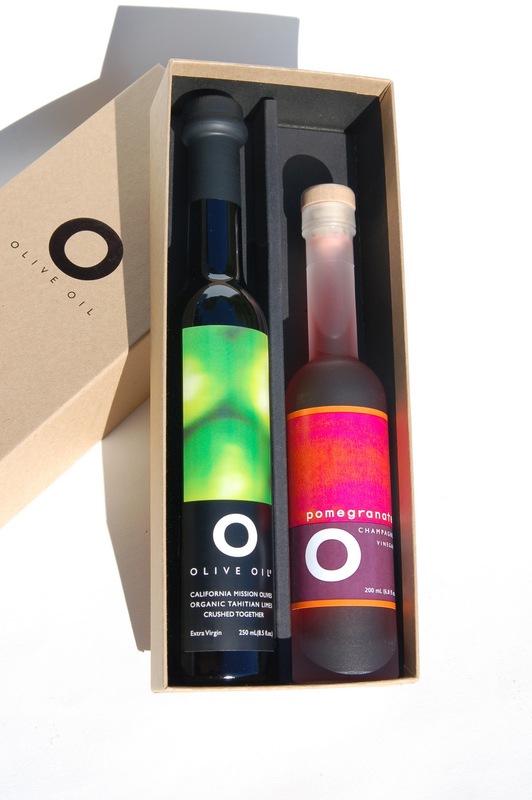 All I want for Christmas is O OLIVE OIL! Clementine olive oil and white vinegar - I'd start by marinating chicken for the grill and end with dressing a light, citrus-y salad to top it with!